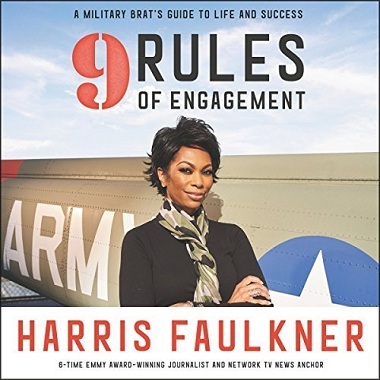 Born into a military family, Harris Faulkner revered her father, a decorated career officer who served three tours of duty in Vietnam and raised his children with the values and ideals of the US military. Accompanying him from posting to posting, young Harris experienced firsthand how success in life was rooted in the knowledge, integrity, and leadership that came from her military surroundings. Indeed, these formative lessons in leadership and work ethic became the guiding principles for her career as a journalist, lessons she credits with her rise to become one of the top hosts on Fox News. Now, she shares the advice, wisdom, and tools that she absorbed through her military upbringing, examining how these ideals have shaped her professional and personal outlook and how everyone can incorporate them into their own lives. Using her father’s career as the backdrop to her experience, she explores the lessons in courage, duty, patriotism, and responsibility that helped her succeed, demonstrating the truth to the axiom that in military families everyone serves – together. Along the way she also interviews current and former military families, generals and other officers, and tells stories from her father’s career to illuminate how and why the message and mission of the military is so effective at changing lives both on and off the battlefield. This instructive book, part memoir, part motivational life guide, reminds us of our most important values – the keys to a successful life.